Is eiteolaí, bitheolaí éabhlóideach agus scríbhneoir eolaíochta mór-ráchairte Briotanach é Clinton Richard Dawkins (26 Márta 1941 a rugadh é). Bhí sé in Ollúnacht Charles Simonyi um Thuiscint an Phobail ar an Eolaíocht, in Ollscoil Oxford, idir 1995 agus 2008. 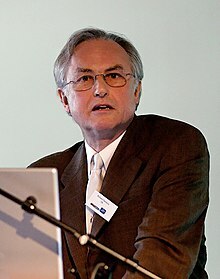 Tháinig Dawkins chun cinn ar dtús le leabhar dá chuid sa bhliain 1976, darbh ainm 'The Selfish Gene'. Chabhraigh sé seo go mór leis an dearcadh géin-láraithe ar éabhlóid a chur i lár an aonaigh agus thug sé an téarma 'meme' ar an saol, rud a chabhraigh le forbairt 'memetics'. Sa bhliain 1982, chuir sé go mór le heolaíocht na héabhlóide, leis an teoiric a léirigh sé ina leabhar The Extended Phenotype, is é sin nach mbaineann éifeachtaí feinitíopacha le corp an orgánaigh amháin ach go mbíonn siad in ann a bheith scaipthe ar fud na timpeallachta, corp na n-orgánach eile san áireamh. Bíonn an teoiric seo á lua go minic ag lucht bitheolaíochta. Tá ceithre leabhar mór-ráchairte scríofa aige ó shin agus bhí sé le feiceáil agus le cloisteáil ar go leor cláracha teilifíse agus raidió maidir le bitheolaíocht éabhlóideach, cruthaíochtachas agus reiligiún. Is duine frith-reiligiúnach neamhbhalbh é chomh maith le bheith ina aindiachaí, ina dhaonnachaí saolta, agus ina sceipteach agus tacaíonn sé le gluaiseacht na 'Brights'. Tugtar an leasainm "rótvaidhléir Darwin" air as díograis na tacaíocht a thugann sé do theoiric na héabhlóide, tagairt don bhitheolaí Sasanach T. H. Huxley a raibh an leasainm "bulladóir Darwin" air. Rugadh Dawkins ar 26 Márta 1941 i Nairobi na Céinia agus tugadh an t-ainm Clinton Richard Dawkins air. B'fheirmeoir agus iar-shaighdiúir coilíneach é a athair, Clinton John Dawkins. Teaghlach ard-mheán aicmeach a bhí ann agus bhí cur síos ar mhuintir Dawkins sa leabhar Burke's Landed Gentry mar "Dawkins of Over Norton". Shíolraigh a athair ó mhuintir Clinton, a bhí ina nIarlaí ar Lincoln. Jean Vyvyan Dawkins ab ainm dá mháthair (née Ladner). Bhí suim mhór ag an mbeirt seo sna heolaíochtaí nádúrtha agus d'fhreagraídís na ceisteanna a chuirfeadh Dawkins Óg orthu faoin saol, i dtéarmaí na heolaíochta. Rinne Dawkins cur síos ar a óige mar "ghnáthóige Anglacánach", ach mhaígh sé go raibh sé in amhras go raibh aon Dia ann ó bhí sé thart ar naoi mbliana d'aois. Ghlac sé a chreideamh chuige arís nuair a ghlac sé le hargóint an deartha, cé gur chreid sé go raibh nósanna Eaglais Shasana go háiféiseach agus gur mó a bhain siad le hord moráltachta ná le Dia. Nuair a fuair sé tuiscint níos fearr ar éabhlóid ag aois 16, d'athraigh a dhearcadh reiligiúnach arís ós rud é gur mhothaigh sé go raibh míniú chastacht an tsaoil le fáil san éabhlóid i dtéarmaí ábhartha amháin agus nach raibh aon ghá le cruthaitheoir mar gheall air seo. Phós Dawkins Marian Stamp sa bhliain 1967 ach fuair siad colscaradh óna chéile sa bhliain 1984. Phós sé Eve Earham níos déanaí sa bhliain chéanna ach tháinig deireadh leis an bpósadh seo chomh maith. Bhí iníon amháin acu seo, Juliet Emma Dawkins, a rugadh i 1984. Phós Dawkins an tríú bean chéile aige sa bhliain 1992, Lalla Ward. Chuir Dawkins aithne uirthi seo tríd an gcomhchara a bhí acu beirt, Douglas Adams. Bhí Adams ag obair le Ward ar an tsraith ficsean eolaíochta, Doctor Who, ar theilifís an BBC. Tá léaráidí déanta ag Ward do bhreis is leath de na leabhair atá scríofa ag Dawkins. Bhog Dawkins go Sasana lena thuistí agus é ocht mbliana d'aois agus d'fhreastail sé ar Scoil Oundle. Rinne sé staidéar ar an zó-eolaíocht ina dhiaidh sin ag Coláiste Baliol, Oxford. Bhí Nikolaas Tinbergen mar theagascóir aige ansin. Eitneolaí clúiteach a raibh Duais Nobel buaite aige, ab ea é. Ghnóthaigh Dawkins céim BA sa zó-eolaíocht sa bhliain 1962 chomh maith le céimeanna MA agus D.Phil. sa bhliain 1966. Is aindiachaí díograiseach, neamhbhalbh é Dawkins. Chomh maith leis sin, is Comhpháirtí Onórach é den Chumann Saolta Náisiúnta, leas-uachtarán de Chumann Daonnachach na Breataine agus Tacadóir Céimiúil le Cumann Daonnachach na hAlban. San aiste leis darb ainm "Viruses of the Mind" (ónar eascair an téarma "faith-sufferer"), mhol sé go bhféadfaí feiniméan an chreidimh reiligiúnaigh agus roinnt de chomhthréithe na reiligiún eagraithe a mhíniú agus anailís a dhéanamh orthu le teoiric mheiméatach, amhail an creideamh go bhfuil pionós i ndán dóibh siúd nach bhfuil creideamh ar leith acu. Sa bhliain 2003, chuir Comhaontas Idirnáisiúnta na nAindiachaithe tús le Gradam Richard Dawkins, in onóir dó. Is mór an cháil atá ar Dawkins as an dímheas atá aige ar antoisceachas reiligiúnach, idir sceimhlitheoireacht Mhoslamach agus antoisceachas Críostaí. Ach tá bhí sé páirteach i ndíospóireachtaí i gcoinne lucht creidimh liobrálach agus eolaithe a bhfuil creideamh acu chomh maith, cosúil leis an mbitheolaí Kenneth Miller, an diagaire Alister McGrath agus Iar-Easpag Oxford, Richard Harries. Chruthaigh Dawkins fondúireacht nua sa bhliain 2006, is é sin, Fondúireacht Richard Dawkins um Réasún agus Eolaíocht. Níl forbairt na heagraíochta seo ach ag tosú ach is é an cuspóir coiteann atá aici ná chun réasún agus eolaíocht a chur chun cinn sa saol. Ghnóthaigh Dawkins céim D. Sc. sa bhliain 1989. Tugadh an leathanach seo cothrom le dáta an 22 Nollaig 2018 ag 10:43.